Canada Lands Company held its first major public consultation event related to the renewed planning for the Rockcliffe redevelopment on Monday, November 26. 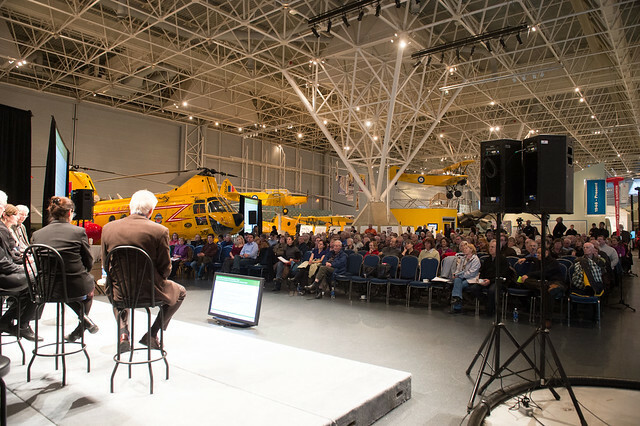 The event, called an "Ideas Fair", was held at the Canada Aviation and Space Museum. Two identical, 45-minute presentations were given by CLC Directors Manon Lapensee and Don Schultz, along with members of the consultant team. The event was exceptionally well attended, with more than 650 members of the public participating in the Ideas Fair. Some 25 consultants, volunteers, and CLC staff managed interactive stations designed to gather ideas and issues from the public. Those stations included a booth providing information on CLC and CLC projects across Canada; an Ideas Wall for the public to post ideas for the redevelopment; a station describing the current site conditions and context; a station providing the redevelopment team's ideas for preliminary design directions; a station explaining the future planning and consultation process; a video "speaker's corner" for people to record their views; and a children's station for young people to provide ideas about recreation and play areas. the importance to account for interim uses, activities, and access to the site during development. The public response helped make this event a success and CLC looks forward to continuing and expanding the dialogue that was begun during the Ideas Fair.